Bulova 1956 American Girl "H"
I picked this American Girl up to see what they are like in person. It isn't a line I thought I would be interested in but I really like how it looks on my wrist. This one is missing the chain but I think it will stay on without an issue. I think it might be the "H". There is an ad with a yellow gold filled version as the "I". This one is 10K white gold filled. 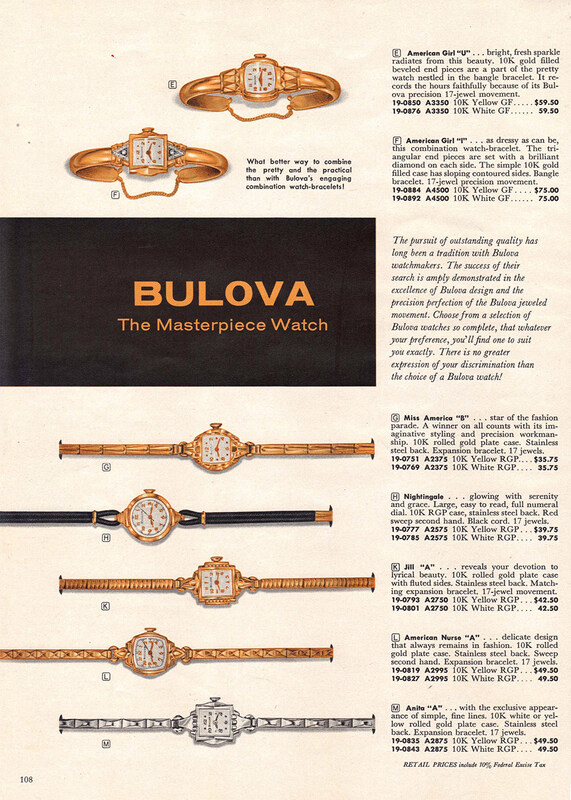 The case and band are marked Bulova. The case and movement are dated L6. 1956 American Girl 'H' looks right to me, good example too! Pricelists show the 'H' variant at two price levels ($71.50 & $75.00) using the same model number 5042. The $75 one states Yellow and 21 jewels, no specifics at the lower price. 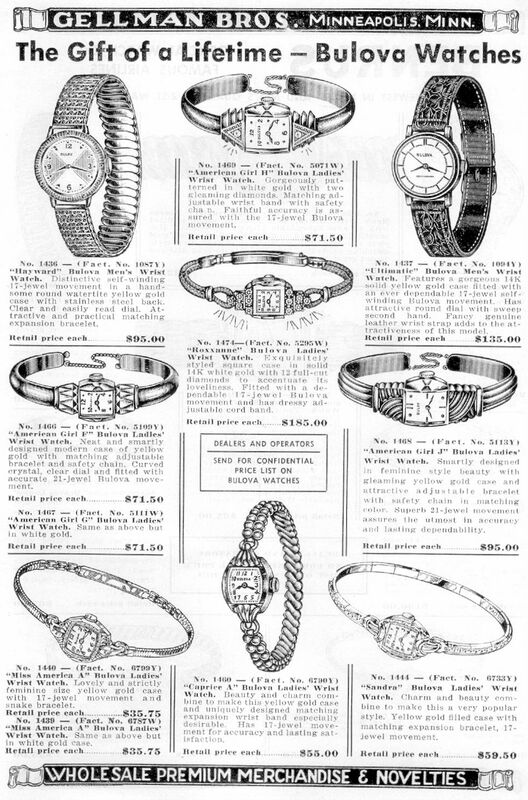 Here is a 1952 ad stating 'H' at $71.50 is white gold. In the ad it also provides a model number 5071, which corresponds to variant 'N' in the pricelists, which is white at the $75 level per pricelists. Both the 'H' and 'N' variants are listed in the Diamond section of the pricelists. 'N' is similar to 'H' showing the same two price points under one model number with the higher priced being white and 21 jewels. I cannot find the 'N' in any ads for this design, but I feel this white gold version is the 'N'. Tentative with either variant. Also, I think the 'I' variant, only at $75 is similar, but has a different bezel that comes to a point in the center L&R, whereas subject watch has a flat section. Yes looking at the "I" and agree with you that the bezel is different. I think your 1952 "H" ad stating white gold and 17 jewels is a good match. Thanks for doing all that research Ken! Attention all eBay and Etsy sellers....Kathy is beginning a new collection - get your American Girl watches ready for sale, she's on a roll! 1956 Bulova American Girl H - BTW this is a really nice watch, I think the chains are still available. lol yes I think I might have to get a couple more in this line. Oh good to know, I will look to see if I can pick up a chain for it. Thanks Geoff! Thank you Bob. lol good one, yes!